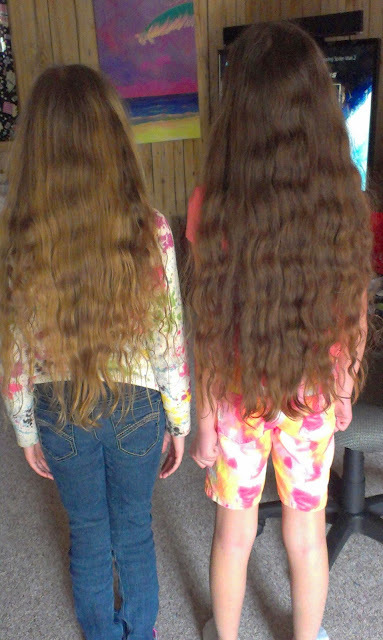 So, as you may have noticed, my girls have very, very long hair. Sure, I trim it on a pretty regular basis, but it just grew and grew. 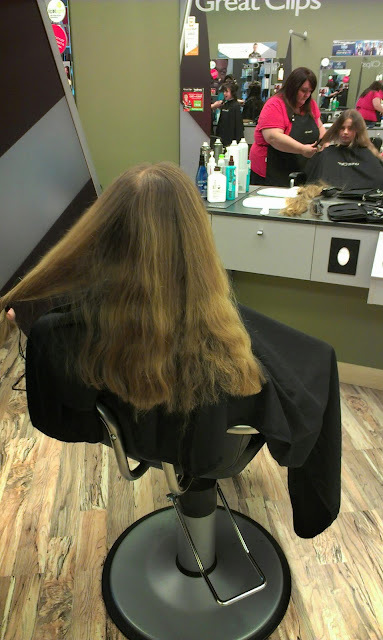 As you can imagine, it took a long time to brush and because of the length they often needed help. That often resulted in complaining because my gentle touch wasn't always so gentle when it came to tangles. I'm no hair stylist, so I have always told them that if they wanted it cut for real, instead of just a trim, I would take them to a salon. I also told them that I would not make them get it cut. That decision was theirs to make...the when, and how much to cut...completely up to them. Some people, who shall remain nameless, thought I was crazy for leaving that decision up to the girls...or for letting their hair grow so long. Homeschool stereotypes and all. But when you have that much hair, with the potential of being naturally wavy or curly, it's a personal decision. A decision made my the one with the hair. Of course, when talking about haircuts, I always give the sound advice not to layer it because of the nature of their hair. The liklihood of it turning curly is great and layers don't do well with naturally curly hair. Yes, speaking from experience. So the discussion of a hair cut increased over the past month or so. Then I shared a story about a student at work that donated her hair to Locks of Love, then a friend of theirs at church did the same. That was it. Get a cut, donate it, have a cute new style. On Good Friday they were ready. In fact, they discussed it half the day and kept asking to go. So off to the salon we went. 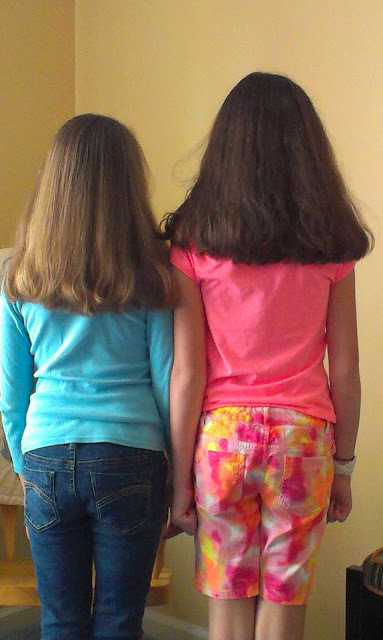 Both girls got a hair cut. 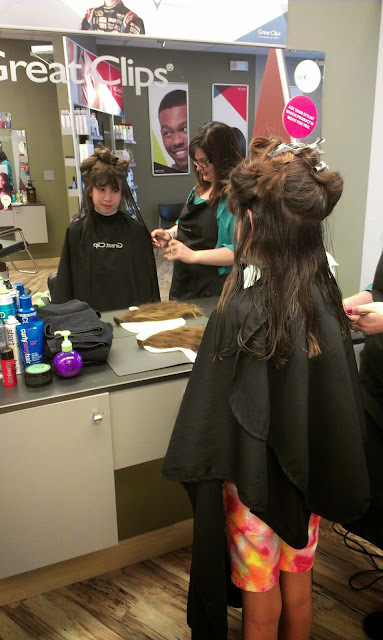 The minimum amount to cut for a donation was 10 inches. One obviously went with about 12 inches, then after evening out the ends this is what they got. The picture above is fresh from the salon. They enjoyed the experience and are very happy with their new looks. Ponytails are easier, brushing is easier. In the humidity it's all a little wavy but it's so much lighter and cooler. And when it's time to go to the pool it'll be so much better. The best part about this whole experience is the final decision was made because they knew their donated hair would be helpful to a child that needed a wig. So remember the last post about the awesome book from Shutterfly? Well, it should be here tomorrow! Fast, right?! Anyway, they sent me a thank you for ordering freebie. I got to order a magnet. They make great magnets. I know you'd like to see it, right? Here it is. I love Shutterfly. They have great quality products and ship things super fast. They also love their loyal customers. Every once in a while I get an email for something free. Well, this time it was a free photo book. I made two in the past. One for the year 2010 and one for our trip to Disney World. Since I seem to take an inexcusable amount of pictures, it's nice to let Shutterfly put them in a book so I don't overwhelm my family and friends with the aforementioned pictures. So this time I decided to make one for my girls. In this digital age I don't have very many tangible photographs of the girls when they were tiny, so I decided to pick the best of the best over the earlier years and create a book that I know they will fight over. Perhaps I should have ordered two. Anyway, here's a little preview. Don't tell them I ordered this, I want it to be a surprise. My hope is that it arrives before Easter. This book will trump any amount of jelly beans and chocolate bunnies. I saw this on StickyGram's blog. I love StickyGram. I got some of my favorite Instagram pics turned into magnets as Christmas gifts for the grandparents. Of course, when they came in the mail I just wanted to keep the magnets for myself. But I didn't. I happily wrapped them up and put them under the tree. Anyway, I love stop motion. It amazes me how much time and effort goes into creating a short film. So I thought this was super and cool and worth sharing. Just add it to the list of things that contribute to my level of nerdiness. Hi there. I am still alive, my clothesline is still up, we are still living life. Here's a flashback picture just so you can see how cute the girls were when they were little. They are getting so big now...11 and almost 9. There's a recent picture over there on the right. We have an awesome Japanese Maple tree that is absolutely gorgeous in the fall. Anyway, I hope to carve out some time to keep you more updated, but I'm not making any promises. funny, haha? or funny, crazy? You don't have to decide right now. But later. Much, much later. No pressure. So,there are two things you should know about me. Okay, maybe you shouldn't know these things. It's not life altering information, and knowing these things may or may not change how you view me as a person, friend, wife, mom, and teacher. You see, I'm pretty normal. A 'blend in' kinda gal. But some things are just different about me. Some people, people that don't know me well, have said I'm a little dramatic. I have no idea where they would come up with such an outlandish idea. Me? Dramatic? Hmm. Okay, maybe a little dramatic. But aren't we all? Just a little? Admit it. You know I'm not alone in this. Anyway, as I was saying, I'm different. Different in how I parent, how I teach, how I am as a wife, how I cook, how I garden and raise chickens, how I sew and crochet, how I decorate...or the lack of decorating would be more accurate. I'm just different. Not in a bad way, not in a better way, just in my own way. I work hard to align how I live and love in accordance with Biblical principles. I do. But I'm still different. Funny, if you will. The goal here is to decide if I'm funny, haha, or funny,crazy. First up, it is very difficult for me to see a crazy hat and not put it on my head. I usually try to put in on one of my girls first and they just duck and cover. "Mommm!" is usually the battle cry against crazy hat modeling in public. They leave me no choice, you see. It must be done. So while we were at Disney World in January...I couldn't NOT put on just about every hat. I mean, Epcot...the World Showcase, there were so many countries and so many hats. But not just there, the gift shops had hats, too. 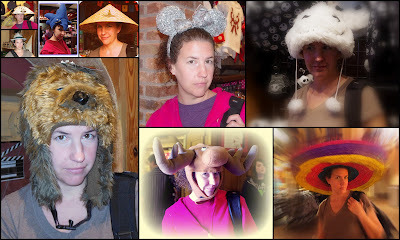 So here is a sampling of hats that I had to try on, in public, at Disney World, much to the chagrin of my children. Thankfully, Tim didn't seem to mind. He was even gracious enough to document each one with a photo! You can click on the collage to see it larger. From left to right: the Mickey umbrella hat, the German alpine hat, Sonic the Hedgehog hat, Chinese hat, silver sequined Minnie ears, Jack Skellington hat, my personal fave-the Chewbacca hat, Canadian moose hat, and Mexican sombrero. By the end of the trip my family was pretty much immune to the embarrassment, but for some reason, they never joined in on the fun. 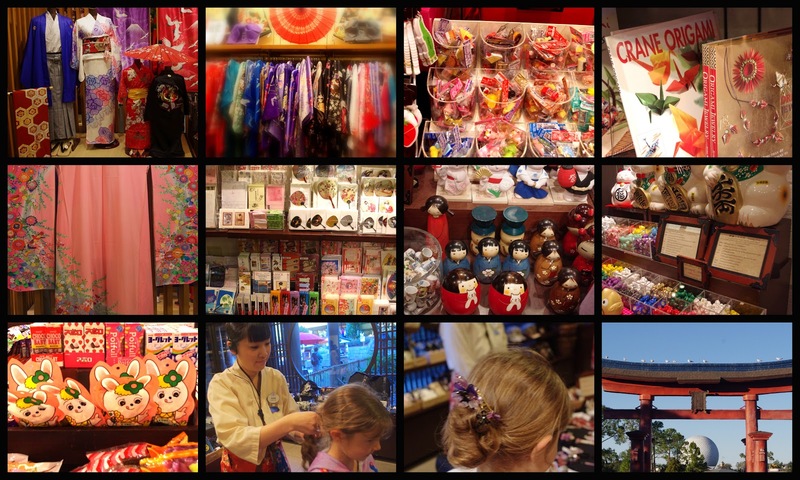 Another thing that you may not know about me - again, it's not life changing information - is that I love Japanese stuff. Being able to spend time in Japan at the World Showcase was really fun. Everything was so cute. The stationery- cute, the note cards, erasers, books, toys, figurines. Just cute. Even the packaging for snacks was cute. I mean, really. The crafty stuff gets me every time. And the clothes, the traditional kimonos and obis were beautiful and amazing. My girls were a little amazed by it all, too. And Tim? Well, he was very patient and let me look and take pictures with out rushing me or wondering why I was taking pictures of kokeshi dolls or bookmarks. So now you must decide. No, you can't put it off. No, you can't skip this part. The pressure is officially on. If you are here on this page and you have read about my shenanigans, then you are fully informed and must now choose.